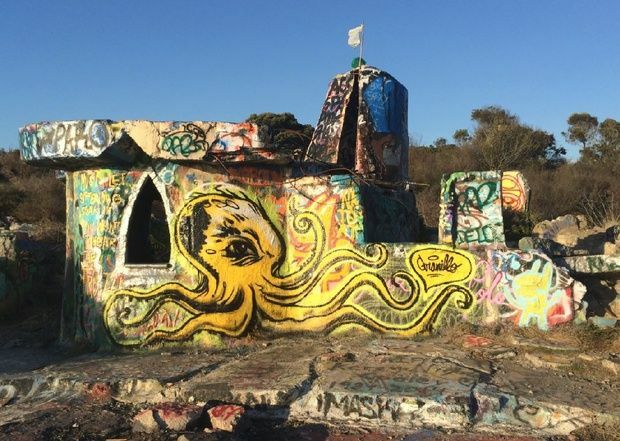 Mad Mark’s Castle is a glorious achievement, a hand-built faerie castle made of scavenged rebar, concrete and plaster that stands proudly atop the Albany Bulb in San Francisco Bay, offering a fantastic view of the Golden Gate Bridge. Completed in 2000 and adopted ever since as an ever-changing graffiti canvas by the numerous artists haunting the Bulb, it remains a stunning piece of one-man art in itself, and the culmination of ‘Mad’ Mark (Marc)’s life’s work. Mad Mark’s Castle by Peter Merts. Mad Mark’s Castle interior (Great Hall) by Peter Merts. 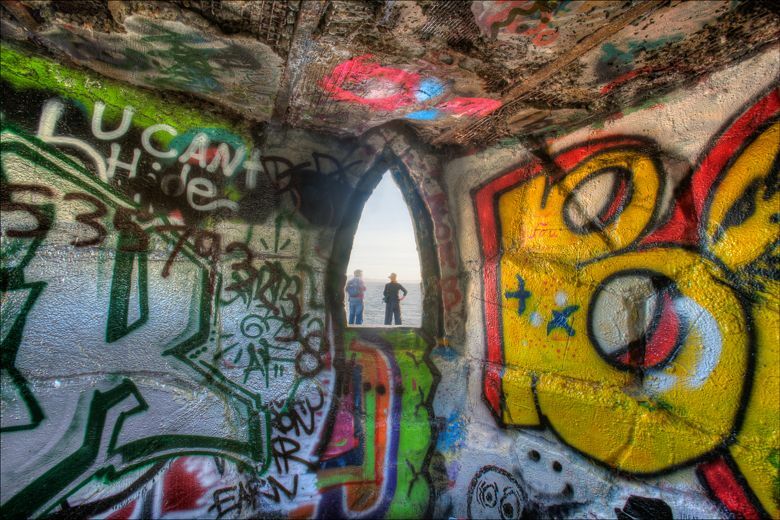 I’ve never been to the Albany Bulb or even to San Francisco- I heard about the Castle from a reader of my book Mr. 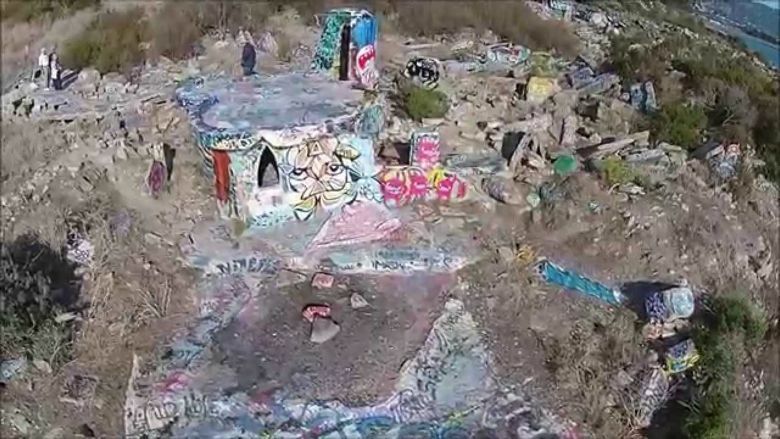 Ruins, which features a similar kind of castle, built on a similar kind of wasteland from similar waste materials like rebar and concrete, by a similarly mentally-damaged and homeless man (akin to Marc) for purposes both cosmic and un-explainable. 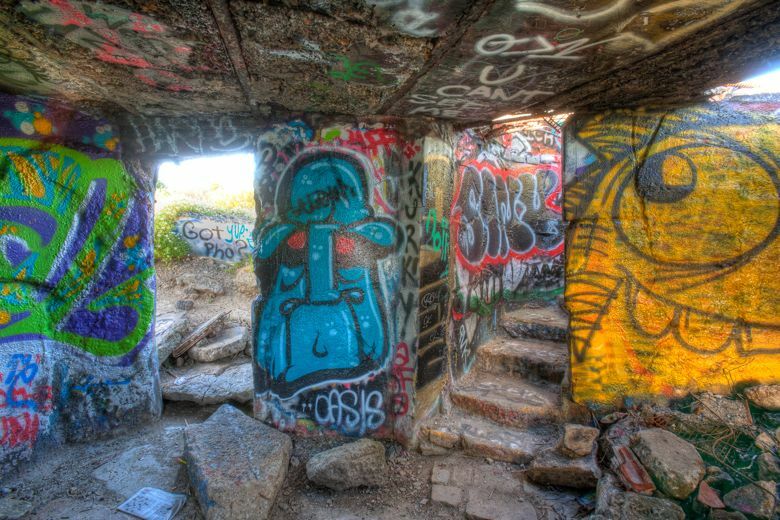 This real-world parallel to the events of my story intrigued me- not only for the parallel but also because I have always loved ruins and follies and crazy constructions. When I discovered the Gankutsu cave in Japan– a complex ‘hotel’ cave carved into solid rock by a single man with a chisel- I was likewise fascinated. So I asked my reader Pamela Deering for more details, and she really came up with the goods. It turns out she knew Marc well, had spoken with him often in his heyday through the 80s and 90s, and could even shed some light on why he’d built what he’d built. Pamela shared pictures with me and stories, which spurred me on to research Marc and his creation further. There isn’t much on internet about him though. Some photos, some stories, but there the tale ends. 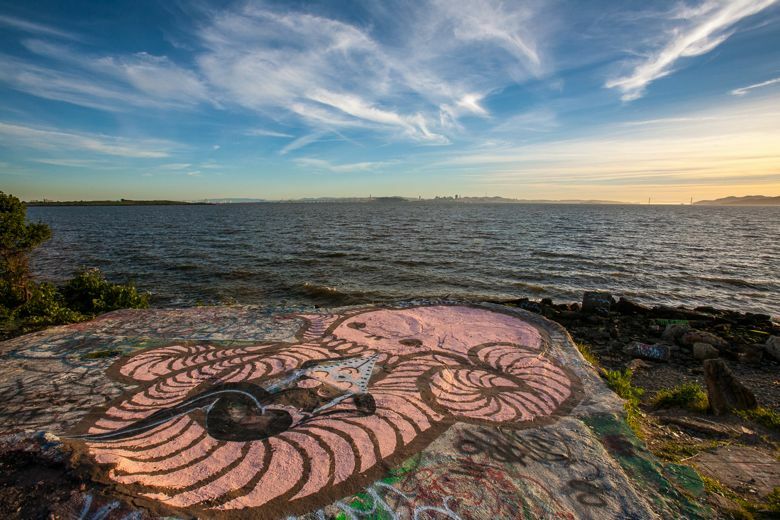 Some background- the Albany Bulb was constructed as a landfill site on the eastern edge of San Francisco Bay, started in 1939 when the Santa Fe Railroad blew up coastal hills to build the Golden Gate Fields racetrack, and shoveled the debris into the Bay to create parking lots. 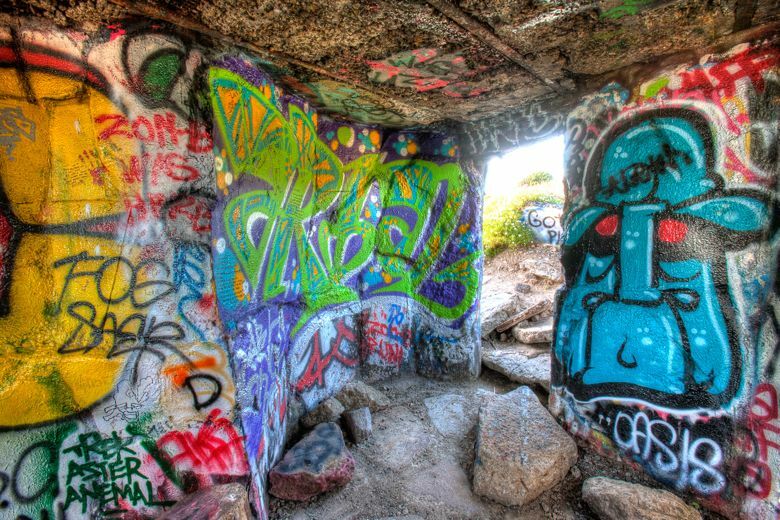 Dumping continued sporadically after that, with the bulb forming as a globular landfill hill at the end of a narrow peninsula causeway in 1963, when the City of Albany and Santa Fe signed a contract to dispose of construction waste. Thus the ‘bulb’ is made primarily of demolished concrete and rebar- the twisted ruins of which still jut organically from the upper layer of clay like desiccated bones. Dumping ended in 1983 when environmental Save the Bay legal efforts forced it to end. 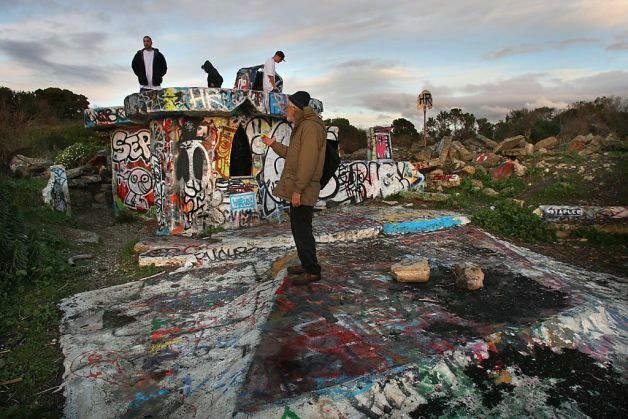 From that point forward, the homeless and the artists moved in, and the Albany Bulb became a kind of artistic homeless commune paying host to some 60 souls at its peak (Wikipedia). 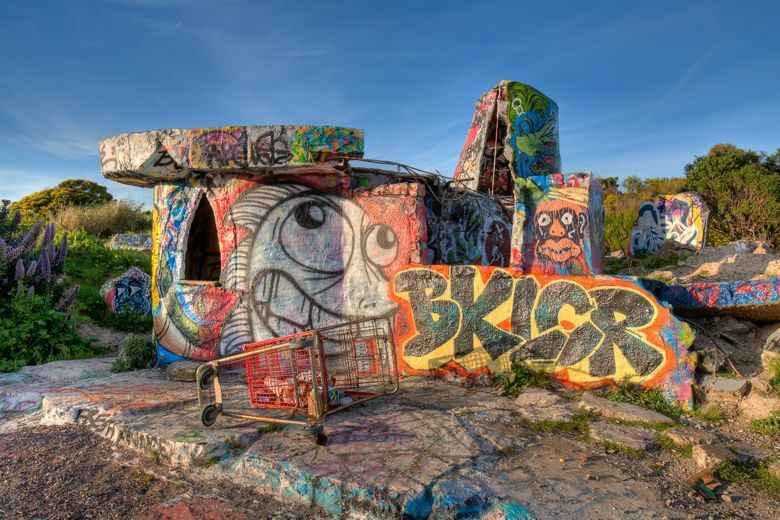 These Bulb-denizens took joy and pride in developing their own amenities and beautifying their trash-pile island with mural, stencil, graffiti and sculpture art. Of course, Jimbow and any others living on the Bulb, most likely along with Marc, are long gone now, ever since Albany City Council voted to evict them in 2013, ultimately offering a $3000 incentive if they would leave their homes. Some of them had lived there for up to 20 years. Mad Mark’s Castle even marked on Google Maps. 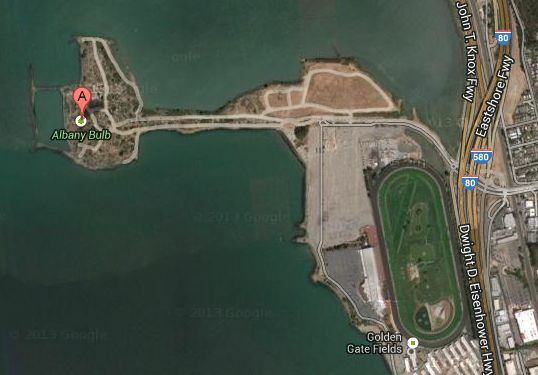 You can clearly see the Golden Gate Fields racecourse here- clearing which began construction of the Bulb via landfill. Mad Mark’s Castle and Forecourt by Peter Merts. Mad Mark’s Castle and Viewing Platform by Peter Merts. Mad Mark’s Castle and Entrance Hall by Peter Merts. 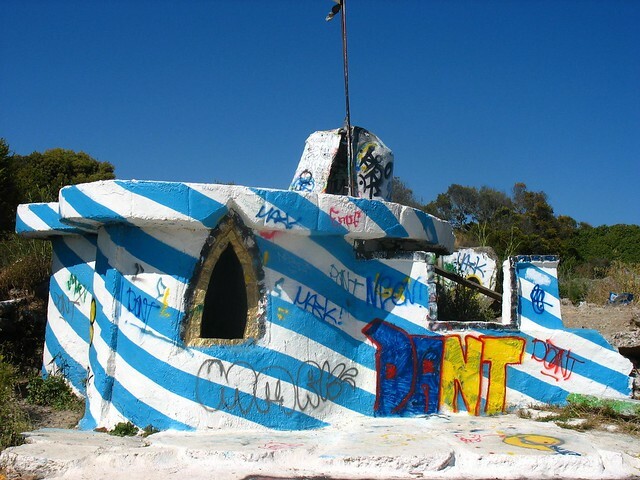 To interrupt Pamela here, my research pointed up a few other unusual beliefs Marc held, one in particular being that Marc built the ‘Fairy Castle’ entirely by night. He held conspiracy theories on the subject, and perhaps believed he was being watched, though he may have been trying to sidestep the local authorities, who had cracked down hard on the ‘homeless’ population there in 1999. In that earlier attempt to sweep the Bulb of its inhabitants, Marc’s castle had survived demolition (along with all other constructions) only because he petitioned it be considered a piece of art rather than a dwelling. It seems he alone was successful. “What made Marc’s situation so tragic is that you could clearly see that he was trying to be the person he was, and his brain was trying to work in its accustomed way, but was sabotaged by the physical damage which left him with serious impediments to maintaining a linear train of thought. A good idea would be derailed by countless detours and cognitive cul-de-sacs, and unfortunately the end result was that he sounded crazy; but really he wasn’t, not entirely.
? Mad Mark’s Castle Servant’s Entrance by Peter Merts. 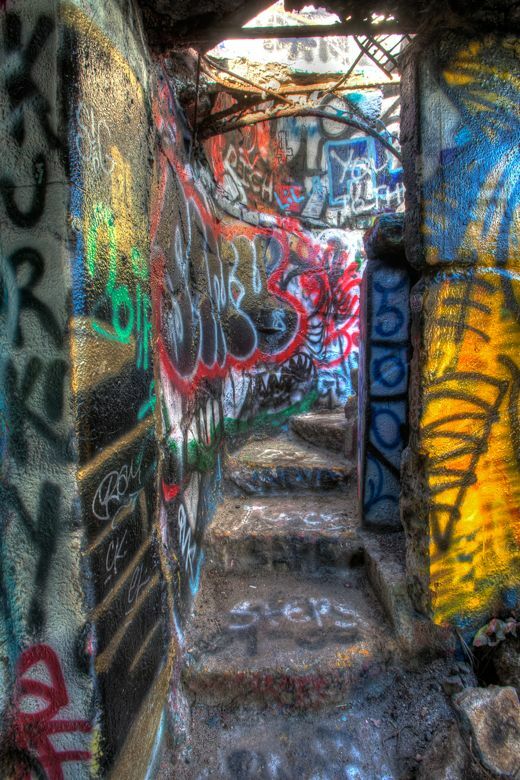 Mad Mark’s Castle Turret Steps by Peter Merts. It makes me think of something from the book Swallows and Amazons. Or perhaps even the Lord of the Flies, but not so negative. 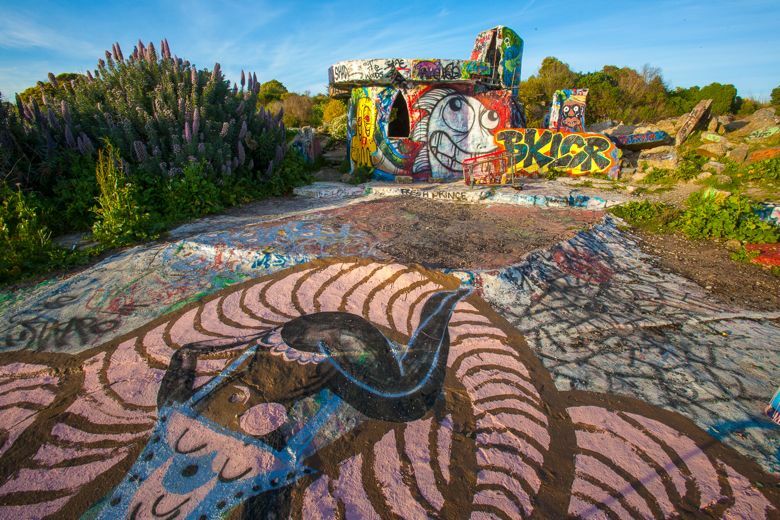 From all that I’ve read the Albany Bulb in the 80s and 90s sounds like a very genteel and kind commune/camp, stocked with out-sized characters very happy to give you a tour, give you a free book, or stand around chatting about the art. I don’t know Marc and am sure that I never will, but hearing the real life recollections from Pamela, and reading up on the place, it gives me some of the feeling I used to get when walking through ruins in Japan, taking photos, experiencing some leftover fragment of the life remaining in the place, now left behind. Every thing we build leaves a trace of us behind. Though Marc’s castle is now bedecked with an ever-changing facade of graffiti art, it is still his. 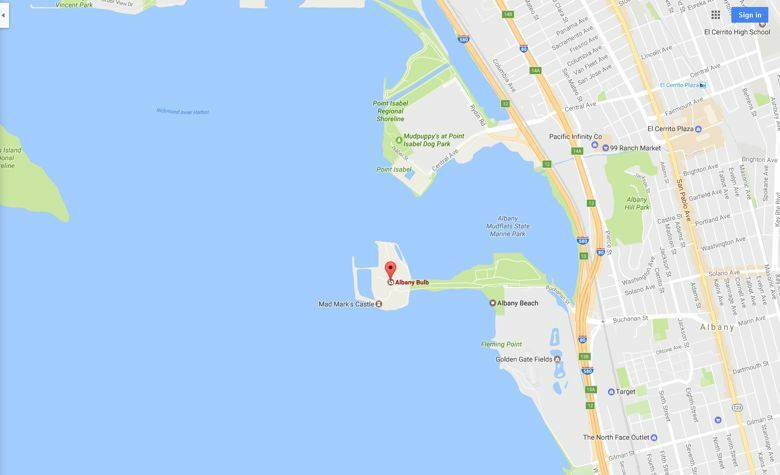 He is in there, along with all the disjointed thoughts he was thinking as he wove rebar together and filled it in with pounded and damp concrete, under the light of the moon with the San Francisco Bay waters lapping off the pier nearby. In its final shape there is something of the struggle he faced as he fought for control over the disparate, broken parts of his mind. I find something oddly comforting in that, and I always have. There’s something comforting that, as of December 2016, Mad Mark’s Castle still stands.